← First piece of new mosaic challenge! Challenge Piece #2, Plus 2 More, Finished! So, you might wonder what I’ve been up to as I haven’t posted in a bit. I’ve been steadily working on a new piece and it’s very different than the stuff I normally do, so it’s taken me a bit longer than I originally thought it might. 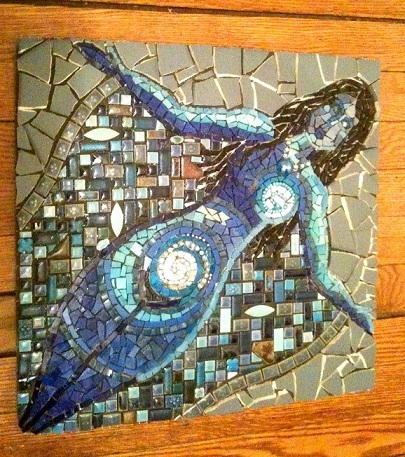 I am anxious to see how she looks once she is grouted. I am new to doing faces and I don’t want her to look ghostly, but I also need her to be somewhat representational in look/feel as her body is composed of textured spirals. So, we shall see. 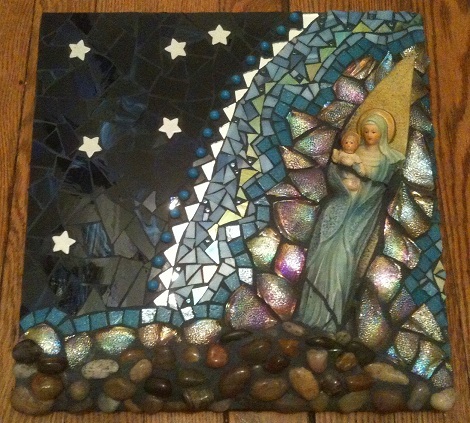 As soon as I get her grouted, I will post an update. In addition to the piece above, I’ve finished two others and so I thought I would post them here so that you can see them. 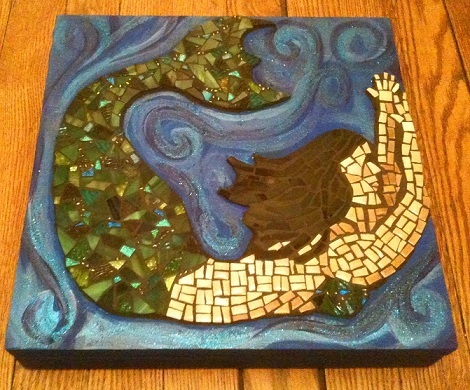 And here’s my mermaid (first challenge piece) all grouted and ready to go! She’s so much lovelier in real life–the photo just doesn’t do her justice! Anyway, that’s what I’ve been busy doing. An update soon on the “Night” piece and I’ve already got another piece cooking so, watch for updates! 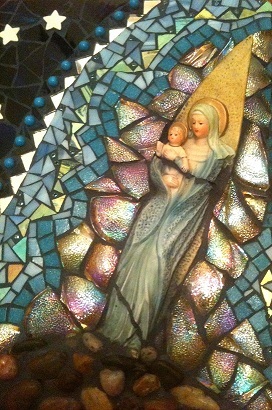 This entry was posted in Finished Work, Work in Progress and tagged night, virgin mary. Bookmark the permalink. 1 Response to Challenge Piece #2, Plus 2 More, Finished! Great work Rachel these look fabulous! Congratulations!